frequently turn towards their parish church, and say with fervor: “Jesus, my God, I love Thee.” The seriously-ill drawing nearer and nearer to the judgment, and the aged going down the hillside of life, relish saying over and over again, with sweet consolation and increasing confidence, the fundamental act of charity: “O my God, I love Thee.” What a change would come over this pagan, irreligious and sinful world, if only people in general could be persuaded to make frequent use of the Christian’s battle cry: “O my God, I love Thee.” Since Almighty God was ready to stay His avenging Hand over the sinful cities of Sodom and Gomorrah, if they held but ten just men, who can estimate the blessings and the graces He would cause to descend in copious showers upon mankind, if everywhere - on sea, on land and in the air, millions were constantly saying: “O my God, I love Thee.” Let us promise to make a veritable apostolate out of the act of love of God, endeavoring to persuade friends, within and without the fold, to form the habit of frequently reciting this blessing-laden prayer. For many a sinner, the act of love, working as an act of perfect contrition, can be the effective means of speedy justification; for many non-Catholics, it may prove the basic factor of their salvation. 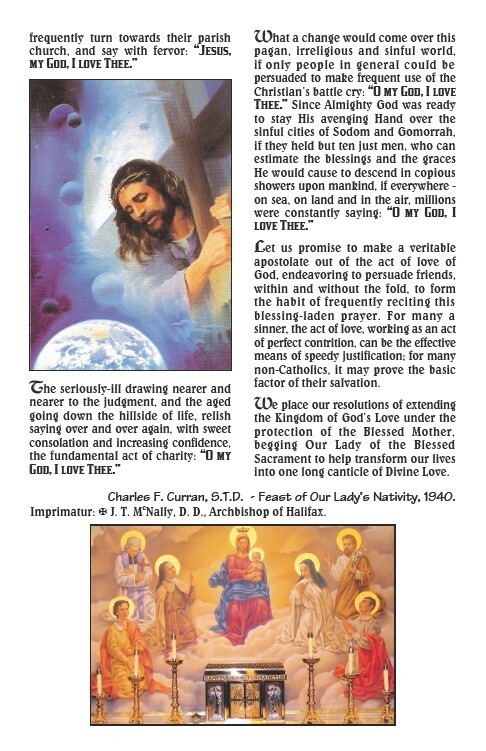 We place our resolutions of extending the Kingdom of God’s Love under the protection of the Blessed Mother, begging Our Lady of the Blessed Sacrament to help transform our lives into one long canticle of Divine Love. Charles F. Curran, S.T.D. - Feast of Our Lady’s Nativity, 1940. Imprimatur: 􀀿 J. T. McNally, D. D., Archbishop of Halifax.